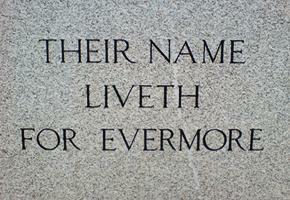 ‘THEIR NAME LIVETH FOR EVERMORE’ reads the INSCRIPTION on the south side of Hove War Memorial on Grand Avenue. Not only does it fittingly commemorate the fallen British heroes of the First World War but also serves as a reminder of the brilliance of its architect, Sir Edwin Lutyens. Soon after the end of the War, a fund was established in Hove of which some was to go towards a memorial and some towards various charitable causes. Several sites were considered for the memorial including Palmeira Gardens and the foot of St. John’s Road. In 1920, Sir Edwin himself chose the lower of two possible sites on Grand Avenue. His original suggestions of a cenotaph and then an obelisk were turned down in favour of a granite column topped with a statue of St. George. The Memorial was unveiled in 1921 by Lord Leconfield after being finished slightly over budget at £1,537. Many regard Sir Edwin Lutyens (1869-1944) as Britain’s greatest architect. In 1918, he was knighted and, in 1921, elected to the Royal Academy. He was involved with the creation of many other war memorials and is best known for the Cenotaph in Westminster and the memorial to the Missing of the Somme in France. He was responsible for much in New Delhi, including the layout of the city and the design of the Viceroy’s house, and also the British Embassy in Washington DC. He was buried in the exclusive crypt of St. Paul’s Cathedral. The longer inscription on the north side of the now Grade II Listed Hove War Memorial reads ‘IN EVER GLORIOUS MEMORY OF HOVE CITIZENS WHO GAVE THEIR LIVES FOR THEIR COUNTRY IN THE GREAT WAR AND WORLD WAR’. The mention of both Wars clearly indicates that the original column was modified to accommodate the fallen of the Second World War. The nearby statue of Queen Victoria at the foot of Grand Avenue is clearly not war-related but many other monuments around Brighton & Hove are. Examples include both the Brighton War Memorial and the Egyptian Campaign Memorial on the Old Steine, the Royal Sussex Regiment War Memorial on Regency Square and the Chattri Memorial to the north of Patcham. This memorial is thoroughly effective despite the absence of a list of the names of the fallen which was in fact recorded elsewhere. For the complete list, see the elegant wooden panels in Hove Library.